I’m a strong believer in community and the power that comes out of having a solid circle of support. I’ve been the beneficiary or kindness, love and support from many others and frankly, I don’t want to live without a solid community. My friends have contributed to the person I am today. As an empowerment coach, who focuses on women’s issues, I’m discovering that many women don’t have communities of support. In fact, the concept is foreign to many and in some instances, objectionable. I don’t trust other women. I can’t be friends with women. Men have less drama. Other women aren’t on my level. I don’t like to be around ‘ghetto’ women. She’s light skinned and has that good hair. These represent just a few statements I’ve heard women speak about other women. As a staunch proud Black and feminist women, I feel pained when I hear women not value the power of female friendships, but I get it. Fact, all of us have issues that can challenge the strongest connections. Fact, many of our troubled connections have more to do with our personal issues and less to do with another person. Fact, the less aware we are of our inner struggles, the more conflicted we will be in our relationships, and our ability to truly connect will be limited. Fact, we attract people in our lives that mirror how we feel about ourselves. If we avoid doing the work on ourselves, we will be confronted with the least desirable, shadowy aspects reflected in our encounters with other people. Our negative experiences with others are often a reflection of those parts of ourselves that we seek to avoid and project onto others. A woman said to me that she doesn’t like outspoken and angry women. She tends to avoid them and discount anything they might have to say. In examining this deeper, this is a person who is, either afraid of her own voice or who never felt like she had a voice. Therefore, she feels threatened by other women who own their voices and righteous angry. Another woman avoids being around women who she perceives to be prettier than herself. Her inner work started with the belief that these women thought they were cute so she convinced herself that she couldn’t spend time with them. In reality, she had very low self-esteem and she projected it onto other women. She was a very lonely person and that, is sad. Imagine if we held the capacity to be in constant self-evaluation, in order to make more conscious choices about our lives and who we allow in our lives? Powerful, right? Well, all of us have the ability. The choice to exercise this ability becomes part of our personal responsibility. Ultimately, we all lose when we fail to do the work on ourselves. We miss out on realizing the power we have within and we miss out on connecting with other amazing women who can be a part of our personal communities. 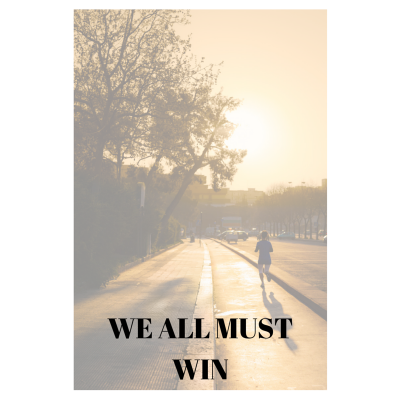 I believe we all have to win. It helps us survive and thrive— individually and collectively. We become more powerful and then the way we live our lives can positively influence others. We also will attract and maintain healthier, loving relationships. You must, however, do the work. You must look into parts of your soul and psyche that contribute to your own self-doubt, poor self-esteem and lack of belief in self. It can be painful and challenging. As humans, we mostly enjoy showcasing the ideal parts of ourselves. We love to adorn the outer self with clothes and jewels that only seek to distract others from seeing the inner parts ,which are often wrought with pain and shame. Once we make the decision to strip down to our souls and do the work in order to, discover who we really are and start walking in our truths, we become more powerful. We learn how to make better choices that serve our higher good and we honor our hurt so it no longer controls us. We see the good in others and we recognize that most people are doing the best they know how. We lose our judgmental nature and embrace those whose paths are different than our own. We all win. My work with women involves helping them to discover the power within. For some women, acknowledging and owning their power is something they’ve never considered. They have been socialized and taught that power is for others and it resides in forces they have no control over. This mindset is limiting and contributes to a sense of powerlessness. Women who do the work by increasing their self- awareness, along with owning their power are winning. These are the women who influence others and posses enormous compassion for others. These are the women who are making a difference in their personal lives and creating wealth—both intangible and real. In the end, I ask you to evaluate yourself. When you start to point the finger at other women, honestly evaluate how you might be part of the problem and do something about it. If you’re unable to do this for yourself, hire a therapist or professional coach who is objective and capable of assisting you in this important process. I believe in us because I believe in me.